Our beautifully shaped Corner Hammocks are great for ferrets, rats, chinchillas, guinea pigs, degus, sugar gliders and other small pets. The dimentions are 18”x14”x14”. Decorative seam really makes a difference in the look and durability. and do not contain fibers that can be easily ingested. We use nickel-plated hardware, so no worries about zinc toxicity. All seams are enclosed. When you install a Corner Hammock inside the cage, please make sure that your fuzz ball can easily access it to prevent falls. You can experiment wtih different shapes if you install hardware on different hight levels (for example top pear link is attached higher than the corner ones or vice versa ). Please insure that all pear links are tightly fastened to avoid injuries. 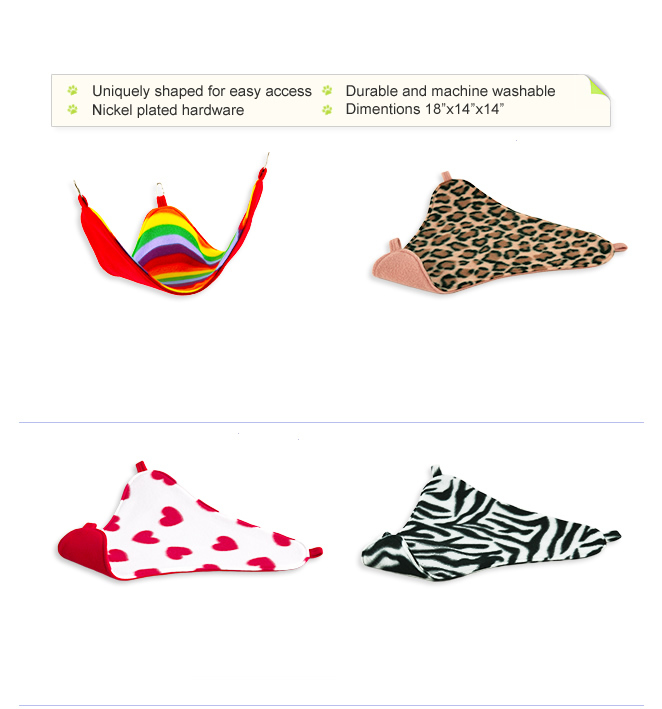 Corner Hammocks are machine washable (cold/warm water, gentle cycle) and dryable (low heat, remove promptly).